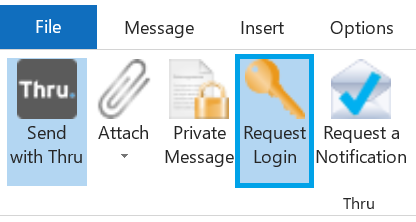 Before sending a Thru message, you have the option of using the Request Login feature that requires recipients to register before they are allowed to download the file or folder you have sent them. With this feature enabled, the recipient cannot download any contents sent with Thru unless they have a registered username and password. This section will show you how to enable Request Login before sending files and also explains how recipients can set up their username and password to download files. To require recipients of a Thru message to register before downloading content, click the Request Login icon while composing your Thru message. Your message will be sent with this feature enabled. Type and send your Thru message.